When it comes to hand-made noodles, everyone’s first question is probably: Why would you want to make your own noodles, is it really worth it?? The answer is: Absolutely! Even if there are a lot of different types of fresh or dried noodles for sale in the supermarket or local market, it is still cheaper to make your own, and the quality difference is well worth it to make fresh noodles. In fact, even if you put aside health problems, quality of ingredients, additives, etc…: the ready-made noodle flavors and textures are difficult to fit in with each person’s different recipes. After all, it is difficult for everyone to adjust accordingly each recipe according to a store-bought noodle, and vice versa. Today, I will tell everyone how to make homemade noodles and let yourself and your family enjoy the unique flavor of a handmade product. There are two main methods for making your own noodles at home. First, rolling the dough out using a rolling pin, and then using a knife to cut it into noodles. Second, there is the use of a noodle machine to make them. Today we are talking about the second method. There are two types of noodle makers on the market. The most recent one is the so-called “fully automatic noodle machine.”The flour and water are poured into the machine. The machine itself completes the mixing process, and then the dough pushed through a panel into the individual noodles. With these so-called “automatic noodle machines,” most of the key components are plastic, and the motor’s power is limited and cannot withstand tougher noodle dough. Of course, there are some more professional machines with all-metal structures and high-powered motors. The problem is that these machines are bulky and VERY expensive. The users of these machines are usually pasta halls or restaurants, and the ones in their kitchens are mostly for professional use. 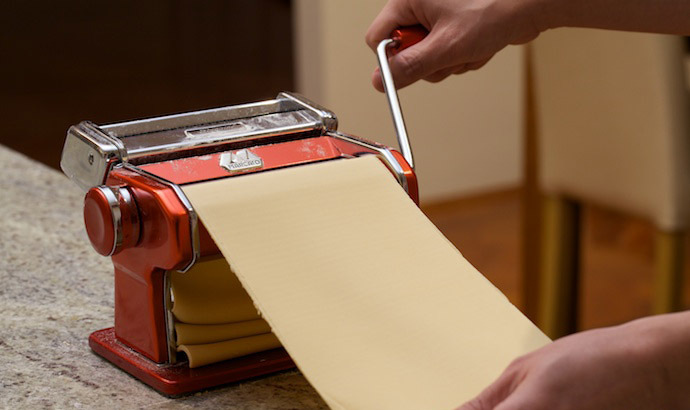 Therefore, a more realistic approach is the traditional pasta maker. 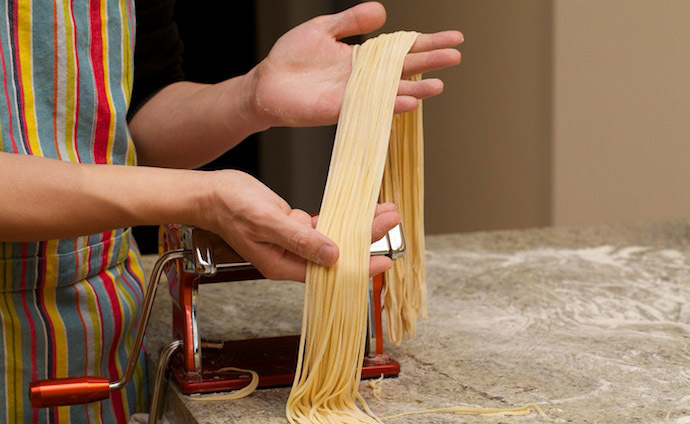 The dough is first pressed into a thin sheet and then cut into noodles. 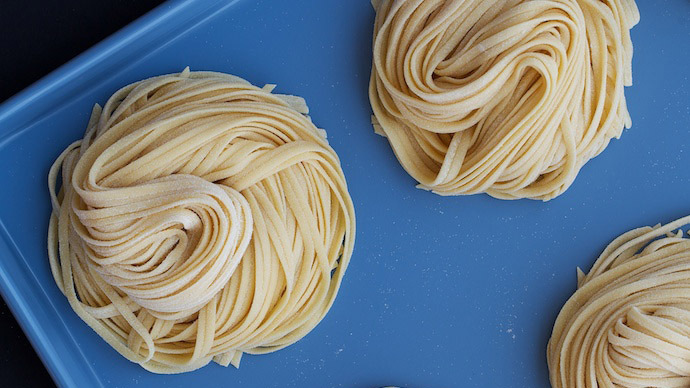 Beginners would usually ask, “is there any difference in using a traditional noodle maker and kneading and cutting the dough by hand?” There are some differences between the two. 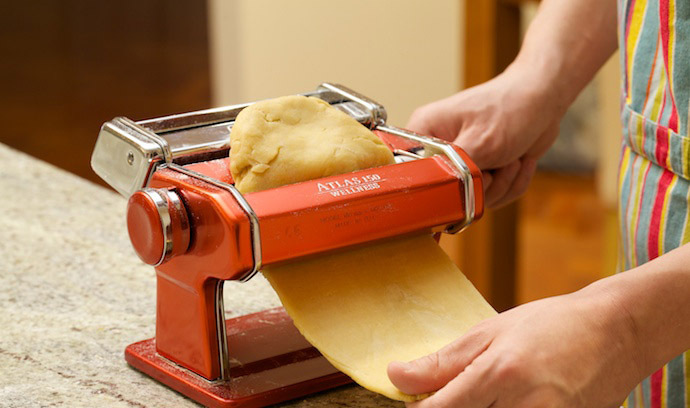 First, the pasta machine can handle a harder dough. It can not only press hard dough into sheet, but it can also assist in the completion of the dough mixing process. A person’s physical strength is limited. 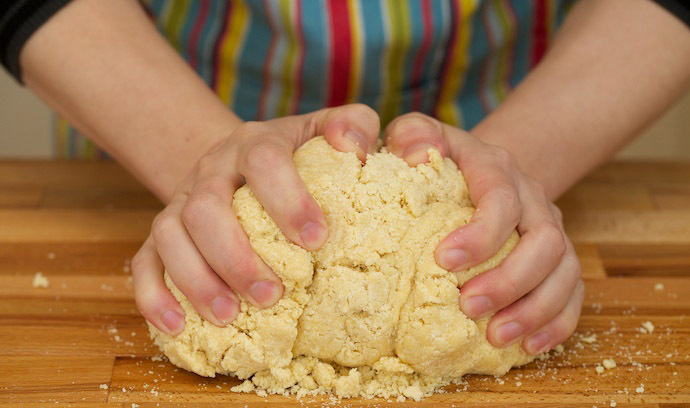 A very hard dough can’t be kneaded by hand at all. So in the area of Guangdong, they began to popularize jook-sing noodles. They spread the dough flat on the cutting board, and then tied one end of a bamboo shaft with ropes down on the cutting board. Then, the master chef sat on the other end of the bamboo shaft and jumped up and down. After the dough was flattened and folded by means of weight and leverage, the process was repeated until the dough was smooth and even. On the other hand, the noodles cut out by the noodle maker have a uniform thickness. 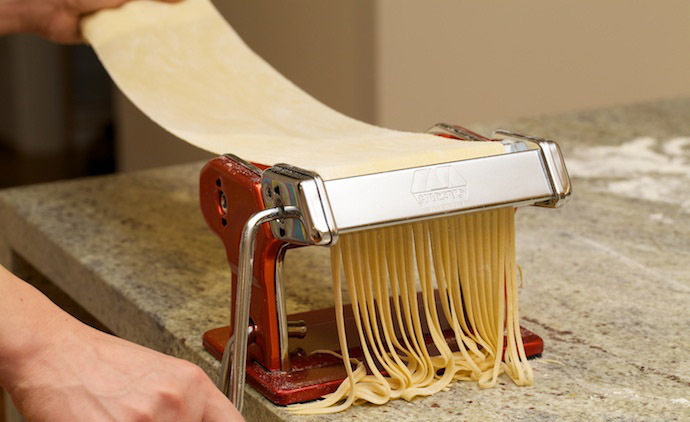 The biggest drawback of the pasta machine is that the width of the cut noodles cannot be freely controlled. It is inevitable that some noodles may be too thick, and some may be too fine. The dough can’t be salted because the machine can’t be cleaned perfectly, there will always be some debris left in the noodle machine. If the local climate is moist, these salts will corrode the metal parts of the noodle maker. 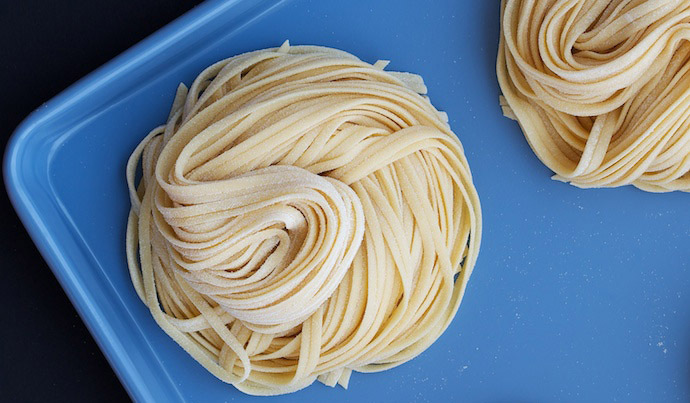 The texture of fresh noodles does not have much to do with the strength of flour used. There is almost no difference between medium flour or high-gluten flour. The amount and proportion of liquid is what plays a decisive role: the less liquid, the tougher the noodle. 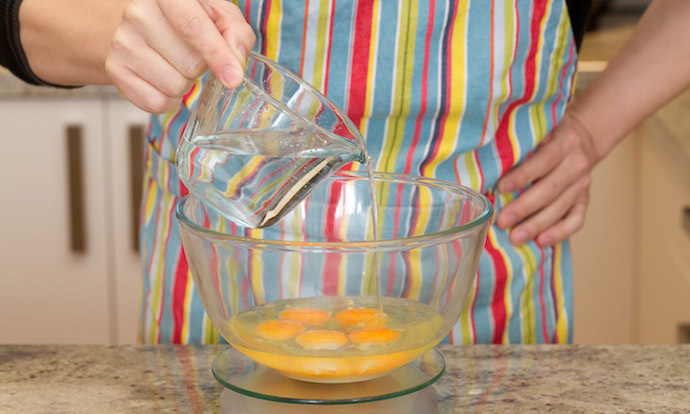 The proportion of eggs is also very important. If you are making fried noodles, egg noodles are most suitable. The noodles have good elasticity and do not easily stick together. If you are making soup noodles, the proportion of eggs should be properly reduced so that the noodles will have better water absorption. Boiled noodles are very smooth. Today, let’s go on the adventure of making noodles (lo mein) from scratch together. I feel a little embarrassed to be so exact here. 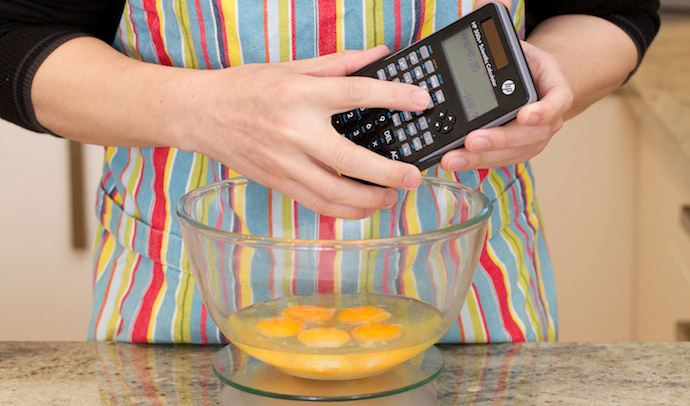 It seems to be overkill to insert a mathematical formula into a food article. However, it seems that this is the only way the content of liquid in the dough be precisely controlled. And this, especially, is a VERY important aspect of the recipe. After several attempts, you can find the one that is most effective for a proper result (for example, if you think the noodles are too tough, you can change 0.35 to 0.36). 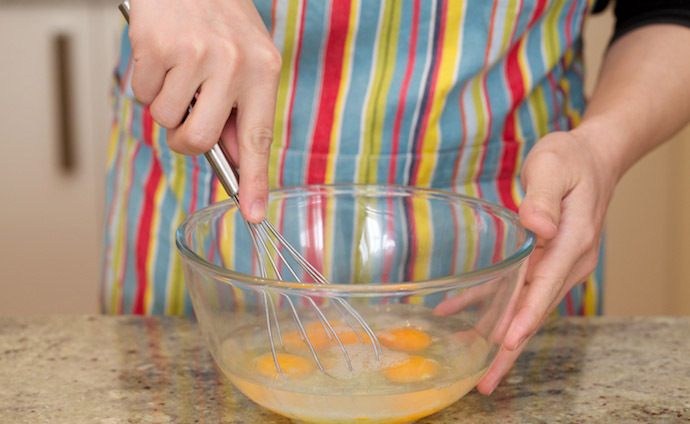 Step 3: Whisk until the water and eggs are mixed. Now to talk about the dough. Of course, you can manually mix the flour and the liquid, the method is not complicated: put the flour in a large bowl, slowly pour the liquid in while quickly stirring to incorporate into the flour. This can make the dough feel softer. When making steamed buns and breads, it is necessary to add the flour into the liquid slowly, so that it is easier to knead by hand. 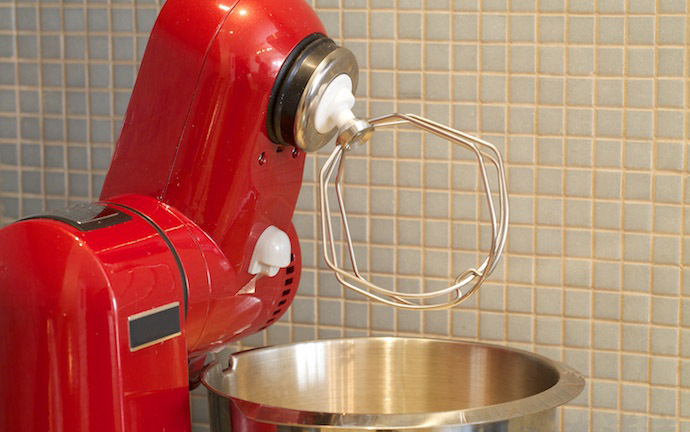 If you don’t use a machine to mix however, the whole process will be more labor-intensive, as the machine not only mixes, but kneads the dough for you. Step 4: Put 1Kg (1000g) of flour into the large bowl of the machine. Step 5: Start the machine using the lowest speed, then slowly pour the liquid in. When you pour, pay attention to how much you are adding. Do not let the liquid gather in the flour. 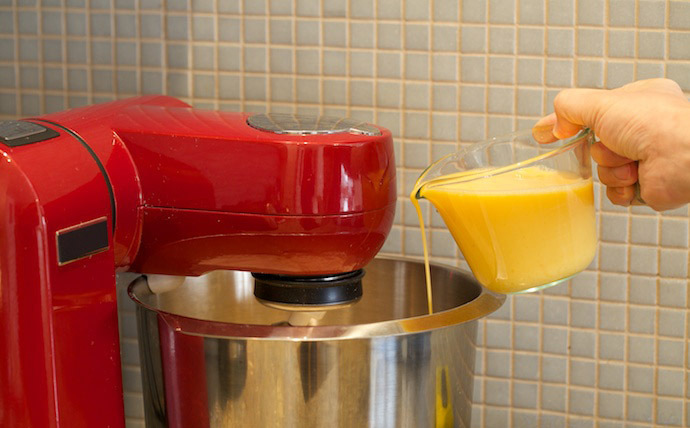 Using the machine, the mixture will start to look like the photo below. 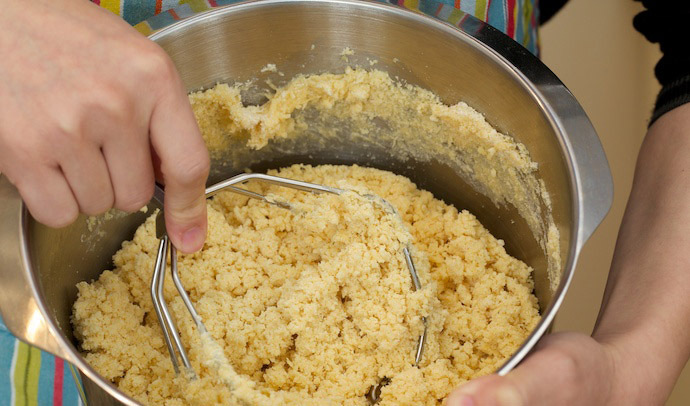 If you are mixing by hand, it may look a bit more coarse than the photo. Step 6: Put the mixture on a cutting board, then start to knead it into the dough. Step 7: Then, evenly divide into 5 small portions, wrap it in plastic and allow to stand for 1 hour so that the liquid is fully absorbed. 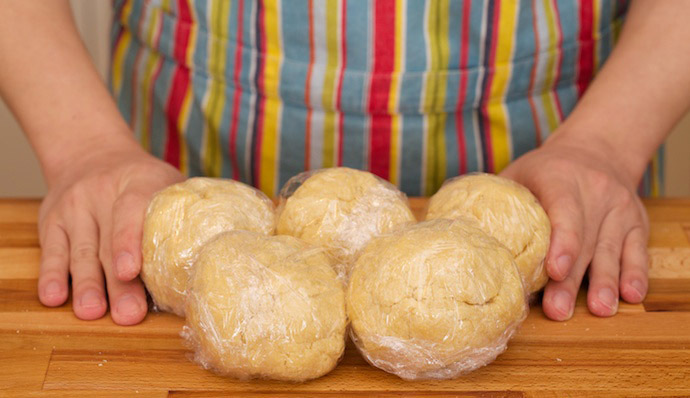 If you are mixing by hand, the resting time can be extended to 2 hours because the hand-mixed dough feels drier. Step 8: Adjust the noodle machine to the thickest setting, take one of the portions, pinch one end flat, and then pass it through the noodle maker. Step 9: The dough coming out of the noodle maker at this stage is very rough, and cannot be used directly to cut into noodles. We continue to use the noodle machine to knead it to a smooth and even sheet. 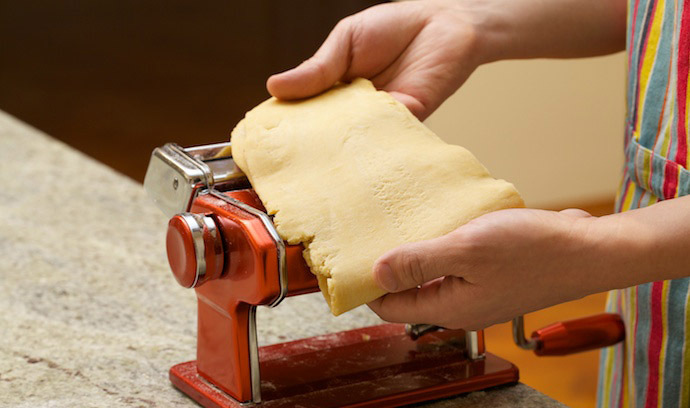 In the past, we folded the dough after the first pass and then continued to roll it through. This is exactly the same method used by the Guangdong chefs to make jook-sing noodles. Although folding at this point saves time, the damage to the pasta machine is greater. The machine bought to use at home costs more than 100 Australian dollars and was broken in a little more than two years. Later, I found a more “mild” way, first thinning the dough to setting 3-4, then going back to the original thickness of the noodle machine, and then folding in half (can be along the length, can also be done along the width). This way, rolling it through the noodle maker is not as tough. 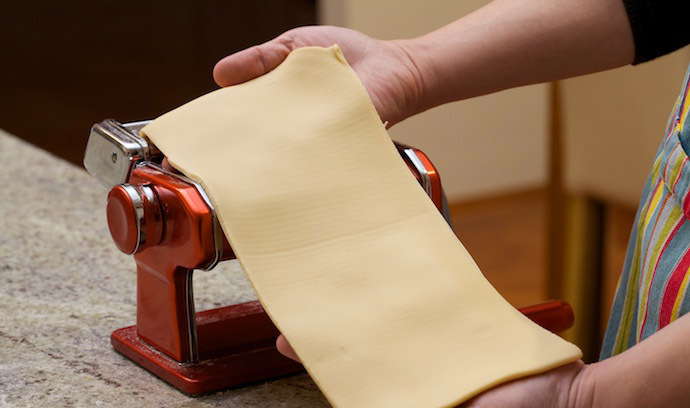 Step 10: In order to make sure the edges of the dough are uniform, the dough should be folded along the length direction and pressed through the noodle machine as well. Repeat this process repeatedly and the dough will become even and smooth. 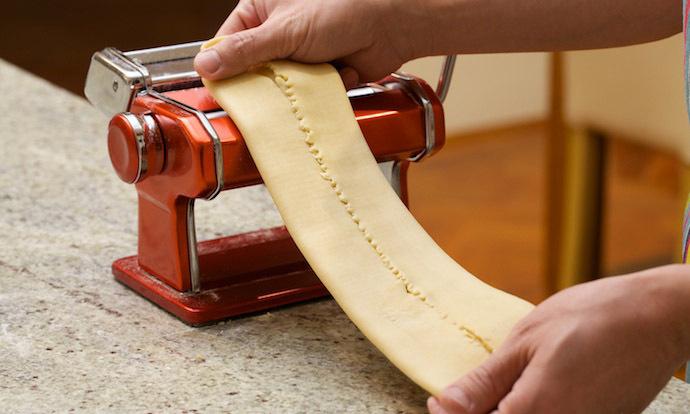 Adjust the thickness setting of the noodle maker and roll the dough through to the desired thickness. When the sheet finally becomes very thin, it is easy for the sheet to be stretched and wrinkled. To avoid this, you need to use one hand to hold the end of the sheet and maintain a certain tension. Step 11: Then, dust each side of the dough with flour, wipe it evenly by hand, and using the cutting end of the noodle maker, cut into noodles. In the process of cutting, the tension on the noodle end should be relatively natural. At this time, the tail end of the dough piece must be pulled by hand to maintain a certain tension. 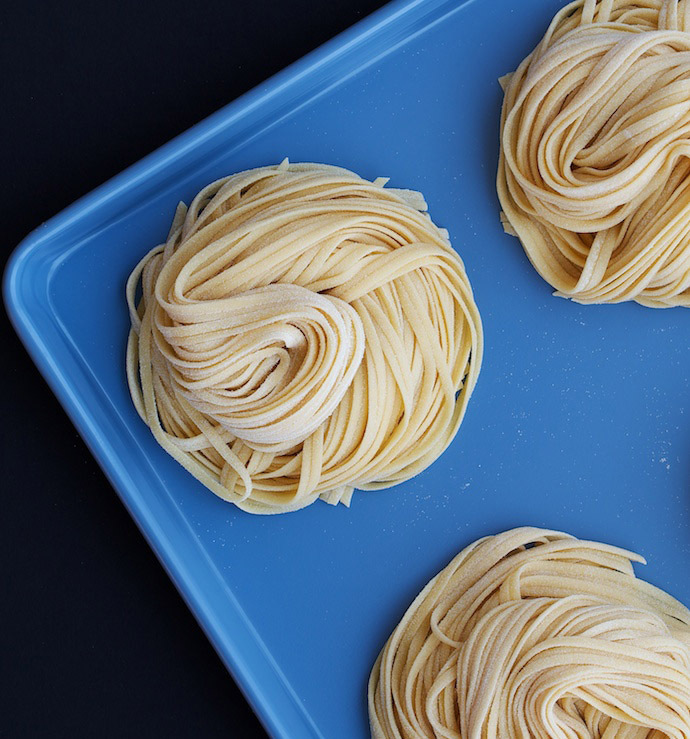 By following these tips, and with some practice, you can easily create your own tasty homemade noodles! The recipe provided here is just a reference. You can make some fine-tuning according to your preferences. If you can’t eat all of the noodles at once, bunch them together, put them in food storage bags, and store them in the freezer of the refrigerator to rest.